I love quick and easy meals for busy nights. 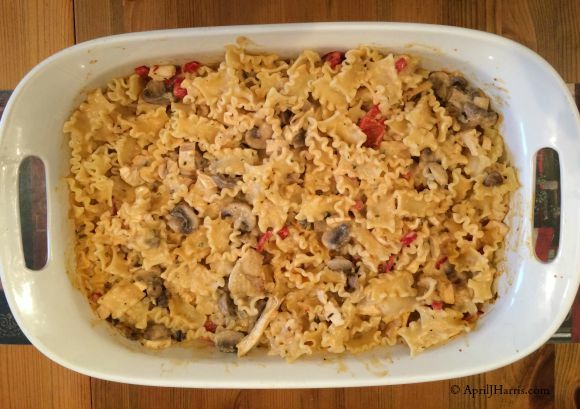 My Chicken Stroganoff Pasta Bake is a an easy, family friendly twist on Beef Stroganoff that everyone will love. It’s also a delicious way to use up leftover roast chicken. The rich, creamy sauce for my Chicken Stroganoff Pasta Bake couldn’t be easier to make. You simply stir a couple tablespoons of flour into some half fat crème fraîche or light sour cream and then stir the mixture into the vegetables and stock in the frying pan. You can, of course, use full fat crème fraîche or ordinary sour cream if you prefer. By the way, although crème fraîche and sour cream are not exactly the same thing, I use them interchangeably in baking and savoury recipes. Sour cream has a slightly sharper flavour as it is ripened for longer than crème fraîche and is also slightly less thick, but I find they perform in exactly the same way. The mildness of crème fraîche does make it more kid-friendly though. 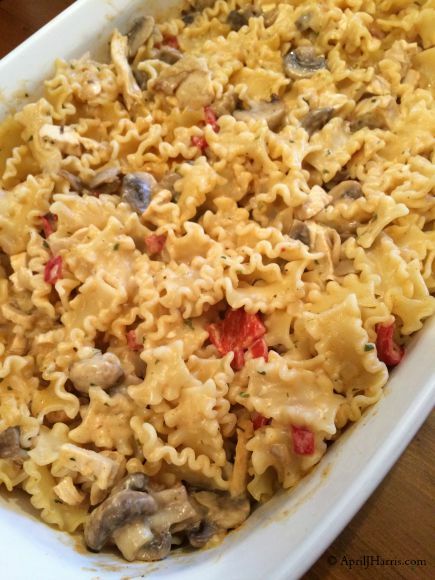 Speaking of kids, you can use whatever pasta shapes you like for Chicken Stroganoff Pasta Bake. As we are all grown ups in our house, I tend to favour lasagnetti. Lasagnetti are cute mini rectangular lasagna sheets about an inch or so in length. 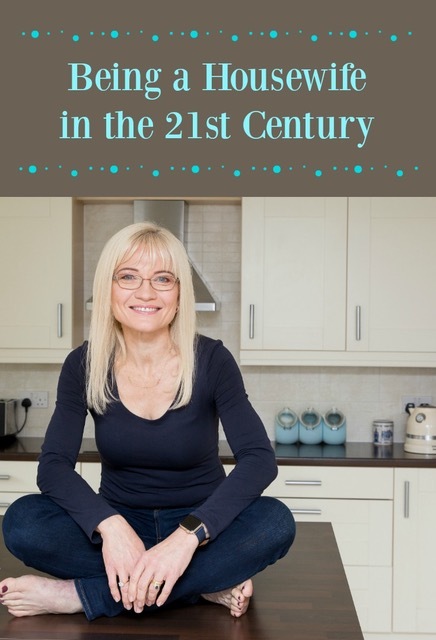 One more thing, I’m always looking for kitchen shortcuts to help on busy nights. My latest favourite? Very Lazy Chopped Garlic is peeled, finely chopped garlic preserved in white vinegar. The vinegar cooks off the minute you add the Very Lazy Garlic to anything and leaves no aftertaste whatsoever. There’s no peeling and no chopping, I just open the jar and add one teaspoon of Very Lazy Garlic for each clove of garlic that is called for. They don’t call it Very Lazy Garlic for nothing! Chicken Stroganoff Pasta Bake is delicious served with simply a salad or some warmed bread or rolls. It’s also great for potlucks and buffets. ⅛ teaspoon nutmeg, freshly grated if possible. Saute the onions, mushrooms and red pepper until they begin to soften. Add the garlic and cook for a moment or two. Stir in the chicken stock, salt, pepper and paprika. Bring just to the boil, stirring almost constantly, then reduce the heat and simmer with the lid off for five to ten minutes. Preheat the oven to 350°F (175°C or 160°C for a fan oven). Combine the flour and crème fraîche in a small bowl, mixing until smooth. Stir the flour and crème fraîche mixture into the ingredients in the frying pan. Bring the mixture in the frying pan just to the boil once again, stirring constantly. Cook and stir for a moment or two until thickened. Stir in the cooked chicken pieces. Drain the pasta and transfer to a large casserole dish. Grate the nutmeg into the chicken sauce in the frying pan. Taste the sauce for seasoning, adding more salt and pepper if necessary. Pour the sauce over the pasta in the casserole dish and stir gently to combine. Cover the dish with foil or an oven-safe lid and bake for 15 to 20 minutes. I like to serve this family style from the centre of the table. Be careful, the dish will be hot! Disclosure: This post contains an affiliate link. Full Disclosure Policy. Thank you, Nicole! I hope you enjoy it! Looks amazing there, April! I was wondering what a bechamelle sauce will do to the recipe. I know it has similar qualities to creme fraiche. This looks fantastic, awesome flavors! Beautiful pictures. This is such comfort food. Love the twist with the chicken. Looks divine, April! We’ll be putting this on the menu, soon! My kind of meal! Love all of the flavors! Oh April, I am loving your lightened up version of the traditional stroganoff. My kids are very picky eaters and I am just betting they will love your casserole! I can’t wait to make it for them when they come to visit! Yum! It is always good to have new chicken and pasta recipes. We will have to try this one soon! April, that sounds scrummy! This is the first time I’ve heard of lasagnetti, and I’m pretty up on pasta shapes. Perhaps we don’t have it here. Can’t wait to look for it. This is seriously up my alley! And the fact that this recipe has chicken, winner winner chicken dinner for me for sure! Loving this right now! Cannot wait to make this! I would love for you to come share at tonight’s Throw Back Thursday link party! This looks like a delicious and easy recipe, love it!! Thank you, Tara, it really is! This pasta looks amazing April! Loving those mushrooms and peppers and the creamy sauce! This recipe sounds great! I’ll have to try it. I’m always on the look out for something new. It kind of reminds me of chicken spaghetti. Here in Texas it’s a must have dish! Thank you, Lisa! It is reminiscent of Chicken Spaghetti in many ways. That is one of my favourites as well! What a warm and welcoming dish April! Pinned and shared! Looks so dreamy good April! Your chicken strogonoff really looks and sounds divine, April! Pinning! Thank you so much, Miz Helen! I’m so pleased to be featured. I hope you have a lovely day too! Ooo man I think I could eat a large bowl of this! Hi Lea, I haven’t frozen this meal as I always use leftover chicken that has been cooked and cooled to make it. (It’s not really safe to reheat cooked meat more than once.) However you could definitely try freezing it if you cooked the raw chicken for the first time as you made the dish, kept it warm, chopped it up and then added it to the sauce. As it’s creme fraiche or sour cream (instead of half and half or heavy cream) I think it would likely freeze okay, although to be fair I rarely freeze pasta. I hope that helps 🙂 It’s just this is kind of my go to dish for using up leftover chicken so I’ve never really thought about freezing it. If you give it a try, please let me know how it goes! This looks so good! Perfect for a weeknight dinner. I love making casseroles like this! Thanks for the recipe!